Article reprinted from ‘The Motor World’ August 25 – 1915. On Saturday 10th July Mr W.E.Hartley traveller for Eyres & Crowle Ltd. left Adelaide for a trip covering both sides of the Darling River country, and he got back on Wednesday 11th August. It was the latest 1915 Buick model he and a friend travelled in, with plenty of dunnage. Two thousand miles were covered between home and home. Mr Hartley went up the Broken Hill side of the Darling and came down the east side, in the latter course taking a wide sweep so as to cover as much ground as possible. “What was the country like?” he was asked. “The recovery must be seen to be believed” said Mr. Hartley. “Six months ago I travelled over it, and it was as bare as – as bare as – well, the bonnet of my car. To day the change is absolutely wonderful. There is feed and water everywhere. I said to one pastoralist. “You are in for a good time” He replied. “We are not in for it, we have got it.?. On my trip I saw plenty of kangaroos, ducks and emus, but very few rabbits. In fact during the whole journey we only saw half a dozen rabbits. I put it down to the credit of the drought that it killed them off.” “Why didn’t it kill the kangaroos and emus?” “They are Australian” replied Mr Hartley laughingly. The car he used was fitted with overhead valves, such as the racing cars have. There cannot be any doubt as to the value of the overhead valve. With the whole momentum of the explosion acts on the piston head, and so it can readily be conceived where the efficiency comes in. 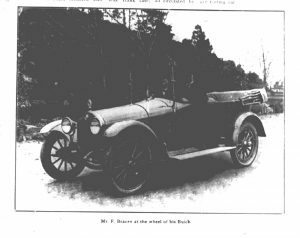 The 1915 Buick is fitted with the Delco self starter and lighter, as an integral part, and during Mr Hartley’s long trip, never once did the apparatus refuse to work. The 35 h.p. engine pulled with remarkable power over the roads so slippery with semi-soluble clay caused by incessant rains that in places chains had to be entwined around the wheels to give them grip.